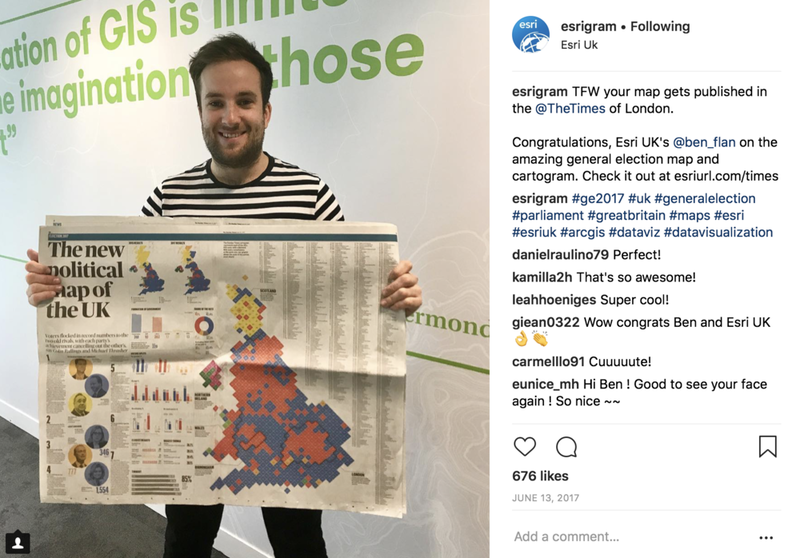 Here’s a cartogram I created for the 2017 UK General Election - but why did I opt for this technique? In UK General Elections, each constituency elects one MP to the House of Commons. However, their geographic size varies greatly as they are divided up based on the underlying population, with each constituency containing roughly 70,000 people. 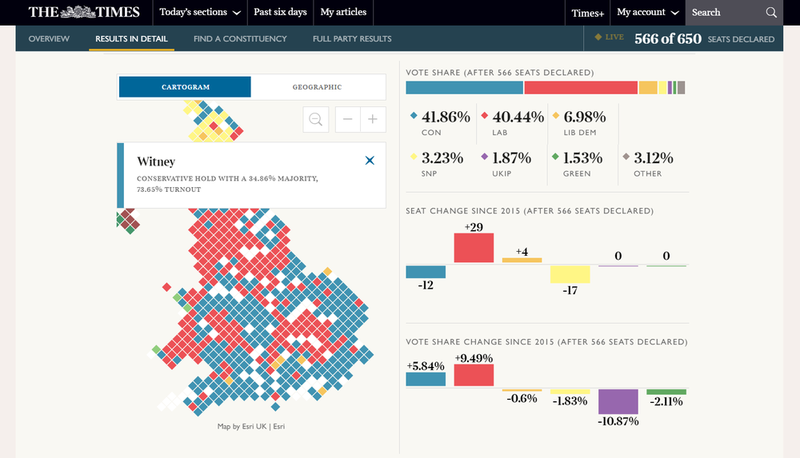 By using cartograms, we can give each constituency an equal visual weighting. Prioritising electoral importance over geographic accuracy can have some side-effects. For example,Scotland represents a considerable geographic area yet elects only 59 MPs, compared with 533 in England. The result of this is a very small and odd looking Scotland. Conversely, densely populated areas such as the South East of England bloat and look much larger than they do on a more conventional map. 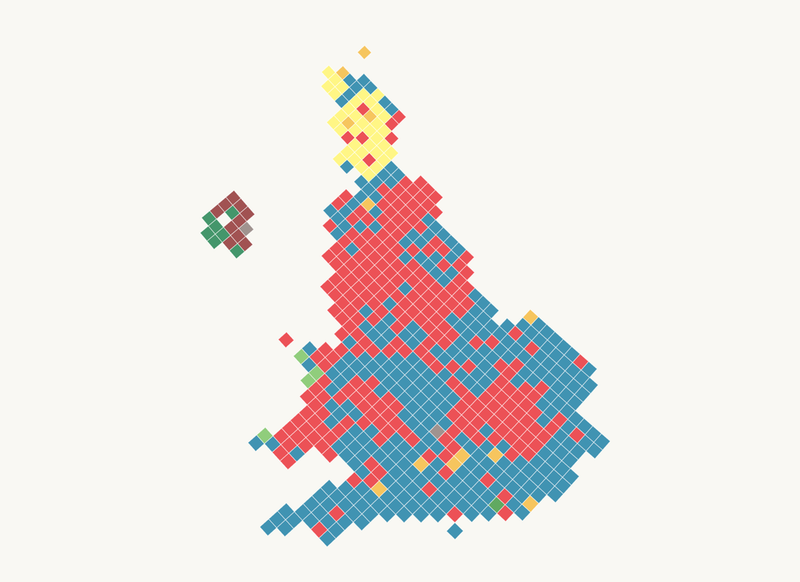 This cartogram was featured on The Times website as part of their General Election coverage. Unlike my previous cartograms, for project I opted for a rhombus over the reliable hexagon. This was purely an aesthetic decision and aligned with The Timeshouse style. I also created a geographic version allowing readers to toggle between the two maps (turns out there are some who don’t like cartograms).